AMES, Iowa–The Iowa State Cyclones pulled off the win and sweep over the Wyoming Cowgirls in the Cyclone Classic on Thursday night in Hilton Coliseum. A few Cyclone serving runs put Iowa State on top in set one. Set two was much closer, but the Cyclones were able to pull away just in time to finish the second set at 25-23. In the third set, an 8-0 run put Iowa State ahead 15-9 and they were able to maintain at least a four-point lead until the set ended at 25-23. They hit .238 in the match while holding Wyoming to a .152 clip. Iowa State led in every statistical category in the match – kills (45-34), assists (39-31), aces (7-1), blocks (10-5), and digs (56-62). Jess Schaeben led the Cyclones to the win with 14 kills on 35 swings with three errors for a .314 hitting clip and 12 digs for her 21stcareer double-double, while Eleanor Holthaus added in another eight kills on 20 swings with two errors to end the night with a .300 hitting performance. Grace Lazard made her presence known with seven kills and two errors for a .278 clip along with three blocks. Piper Mauck produced 30 assists and six digs while Hali Hilegas picked up a match-high 20 digs. For the Cowgirls, Emily Lewis put away nine kills on a .222 clip and Tara Traphagan added seven more while Cori Aafedt dished out 17 assists and collected seven digs. The Cyclones will host state-rivals, the Iowa Hawkeyes, in the Cyclone Classic on Friday night as a part of the Iowa Corn Cy-Hawk Series. AMES, Iowa – Iowa State opened up the Cyclone Classic with a 3-0 (25-17, 25-23, 25-20) win over Wyoming Thursday night at Hilton Coliseum. The win improved ISU to 7-4 on the season, while the Cowgirls fell to 8-2. The ISU effort was led by a double-double of 14 kills and 12 digs from Jess Schaben, while Hali Hillegasled the back-row with 20 digs, her sixth match of the season reaching the 20-dig plateau. The Cyclone serve fired seven service aces, while the ISU block finished with 10.0 total blocks. A strong serving run from Hali Hillegas helped ISU out to a 5-1 lead. A 5-0 run on the Grace Lazard serve opened the advantage to 11-5. The Cyclone lead got up to as many as 10 points at 20-10. Iowa State was strong behind the service line, posting three aces in the frame. ISU held the Cowgirls to a .097 hitting percentage, with Josie Herbst and Meegan Hart’s block giving the frame to the Cyclones at 25-17. Wyoming reeled off the first three points of the frame, but ISU was able to settle in and got back ahead at 7-6 on consecutive Piper Mauck aces. The Cowgirls rallied to get back ahead 14-13, with ISU getting back ahead at 15-14, and UW retaking the lead at 16-15. The Cyclones were back ahead at 19-18 on a Hillegas ace, but Wyoming was able to tie it back up at 23-23. Lazard killed to get ISU to set point first, which Schaben put away with a roll shot at 25-23. A 4-0 Cowgirl run put the visitors ahead 9-7, but behind the Mauck serve Iowa State roared back with an 8-0 run to get ahead 15-9. The ISU block was dominant, recording five blocks in the first 13 Iowa State points of the frame. Wyoming made a small rally late, going on a 3-0 run to cut the ISU lead to 20-16, but the Cyclones were able to finish it off when Candelaria Herrera killed on the slide at 25-20. Jess Schaben. The senior had a tremendous match, posting her match-high 14 kills at a .314 hitting percentage. She also got her 21st career double-double with 12 digs. Iowa State is back in action at the Cyclone Classic on Friday against Iowa as part of the Iowa Corn Cy-Hawk Series. First serve between the Cyclones and Hawkeyes will be at 6:30 p.m. with Cyclones.TV Powered by Mediacom showing the match. 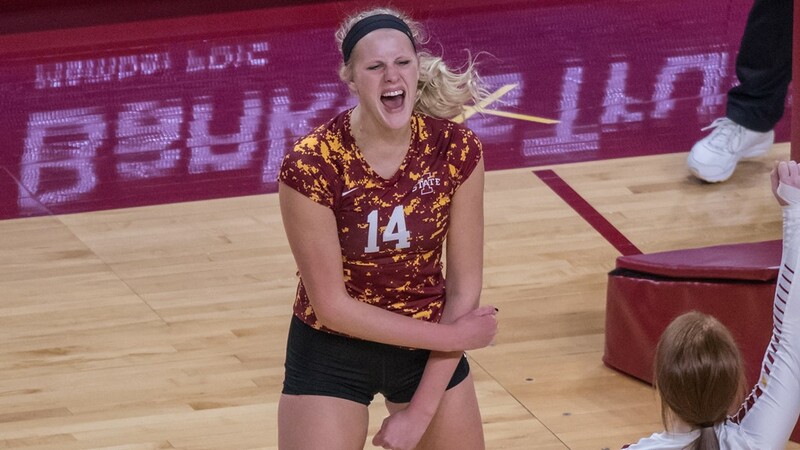 AMES, Iowa (Sept. 13, 2018) – The Wyoming volleyball team dropped the opener of the Cyclone Classic on Thursday evening at Hilton Coliseum, falling to host Iowa State, 3-0. The Cowgirls (8-2) were led by senior Emily Lewis, who tallied nine kills on a .222 hitting percentage in the match. Reed Copeland led the Pokes in blocks, contributing on four of the team’s five total rejections. Junior libero Madi Fields finished with 18 digs to lead the team. Wyoming struggled to find an offensive rhythm, hitting a season low .152 for the match to Iowa State’s .238. Wyoming got out to a slow start in set one, as the Cyclones jumped out to a 3-0 lead early and never looked back, going on to win the frame, 25-17. The Cowgirls were able to settle in in the second set and put together a more consistent offensive groove. The Pokes hit .361 in the period and jumped out to an early lead; however, the two teams traded blows for much of the set, which included 11 ties and five lead changes, and Iowa State pulled away late for the 25-23 set victory. The Cowgirls and Cyclones went back and forth early on in the third set, but a 6-0 run for Iowa State midway through the frame gave the Cyclones the lead for good, going on for the 25-20 clincher. Wyoming will look to respond on Friday afternoon when they match up with Syracuse on Friday at 2:30 p.m. MT.